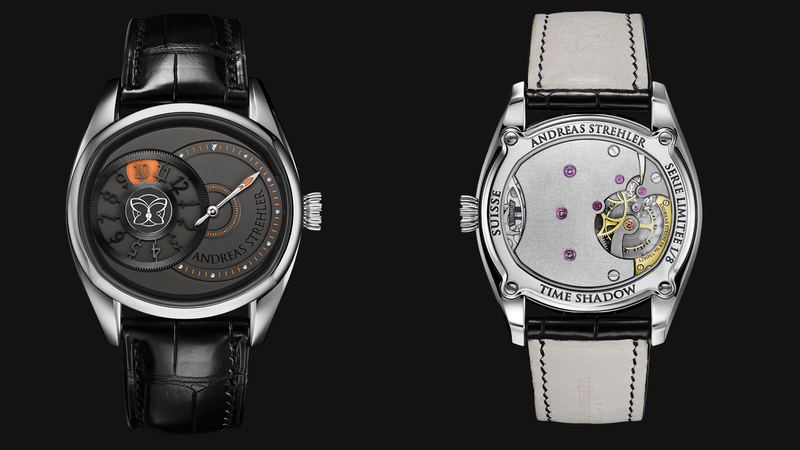 To readers of the book on Andreas Strehler, the words “We actually could…” will be familiar. If in a conversation with his team these words are uttered by Andreas seemingly apropos of nothing, they always are the introduction to the presentation of a completely new idea, often in the form of a new watch. Now, for most people organising a show like SalonQP is a lesser challenge than designing and manufacturing a completely new watch, but for some time Andreas had been working on various new concepts and felt that it would be perfectly possible to bring something to life in the given timeframe. Some frantic work and a few weeks later the first prototype of the Time Shadow was born. The dial of the Andreas Strehler Time Shadow is finished in a grey galvanic treatment. The hours are indicated by a rotating disc. This disc turns around a small cylinder displaying the typical Andreas Strehler butterfly logo. The hour is shown by the cut out numeral which wanders over an orange luminous dot. This disc is, in fact, a large gear wheel, linked to the visible gear wheel of the minute hand. The minute hand thus directly drives the hour disc. The two gear wheels form the number eight which is also the mathematical sign for infinity. For the first time, Andreas Strehler has used stainless steel for a case to match the more technical aspect of the dial. The movement, as usual specifically designed for the watch, is finished in grainage, the edges of the bridge are hand-bevelled and are polished by hand. The ¾ bridge is designed to emphasise two specific features of Andreas Strehler watches: The escapement designed by Andreas Strehler and the true conical gear wheels of the winding mechanism. The Time Shadow is limited to only 8 pieces. Calibre: Time Shadow hand winding, 132 parts, frequency 3 Hz / 21‘600 A/h, 32.0 x 30.0 mm, height 5.9 mm, 20 jewels, double main spring barrel, edges bevelled and polished by hand, decorated in-house movement with ¾ bridge.